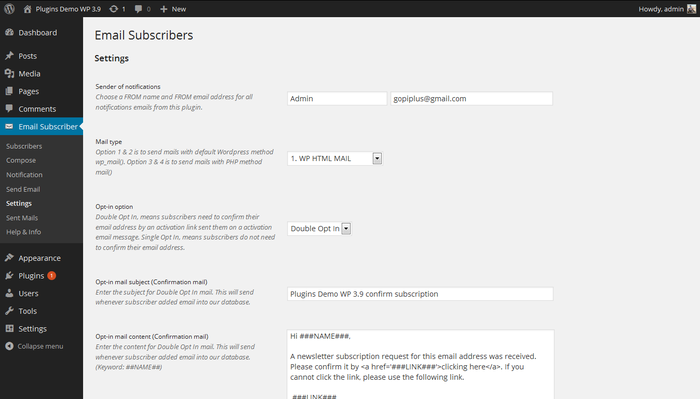 Go to your Dashboard ==> Email Subscribers ==> Settings page to modify the plugin default setting. In this page you can modify optin, welcome mail content. admin email and newsletter sender emails etc..
1) Sender of notifications: Choose a FROM name and FROM email address for all notifications emails from this plugin. 3) Opt-in option: Double Opt In, means subscribers need to confirm their email address by an activation link sent them on a activation email message. Single Opt In, means subscribers do not need to confirm their email address. 4) Opt-in mail subject (Confirmation mail): Enter the subject for Double Opt In mail. This will send whenever subscriber added email into our database. 5) Opt-in mail content (Confirmation mail): Enter the content for Double Opt In mail. This will send whenever subscriber added email into our database. 6) Opt-in link (Confirmation link): Double Opt In confirmation link. You no need to change this value. 7) Text to display after email subscribed successfully : This text will display once user clicked email confirmation link from opt-in (confirmation) email content. 8) Subscriber welcome email: To send welcome mail to subscriber, This option must be set to YES. 9) Welcome mail subject: Enter the subject for subscriber welcome mail. This will send whenever email subscribed (confirmed) successfully. 10) Subscriber welcome mail content: Enter the content for subscriber welcome mail. This will send whenever email subscribed (confirmed) successfully. 11) Mail to admin: To send admin notifications for new subscriber, This option must be set to YES. 12) Admin email addresses: Enter the admin email addresses that should receive notifications (separate by comma). 13) Admin mail subject: Enter the subject for admin mail. This will send whenever new email added and confirmed into our database. 14) Admin mail content: Enter the mail content for admin. This will send whenever new email added and confirmed into our database. 15) Unsubscribe link: Unsubscribe link. You no need to change this value. 16) Unsubscribe text in mail: Enter the text for unsubscribe link. This text is to add unsubscribe link with newsletter. 16) Text to display after email unsubscribed: This text will display once user clicked unsubscribed link from our newsletter. 18) Message 1: Default message to display if any issue on confirmation link. 19) Message 2: Default message to display if any issue on unsubscribe link.